Merciful Lord, who raiseth up sinners by thy boundless compassion and mercy: Cause the desert sun to burn away our coarseness and to melt our hardness of heart, that, like your servant Mary of Egypt, we may not depart from this life until we understand the ways of repentance and the benefits of prayer; through Jesus Christ our Lord, who liveth and reigneth with thee and the Holy God, one God, for ever and ever. Amen. Merciful Lord, who raises up sinners by your boundless compassion and mercy: Cause the desert sun to burn away our coarseness and to melt our hardness of heart, that, like your servant Mary of Egypt, we may not depart from this life until we understand the ways of repentance and the benefits of prayer; through Jesus Christ our Lord, who lives and reigns with you and the Holy Spirit, one God, now and forever. Amen. 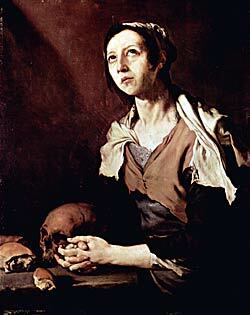 Mary of Egypt (c. 344 – c. 421) is revered as the patron saint of penitents. The primary source of information on Saint Mary of Egypt is the Vita written of her by St. Sophronius, the Patriarch of Jerusalem (634–638). Most of the information in this section is taken from this source. Mary was born somewhere in the Province of Egypt, and at the age of twelve she ran away from her parents to the city of Alexandria. Here she lived an extremely dissolute life. After seventeen years of this lifestyle, she traveled to Jerusalem for the Great Feasts of the Exaltation of the Holy Cross. She paid for her passage by offering sexual favors to other pilgrims, and she continued her habitual lifestyle for a short time in Jerusalem. Her Vita relates that when she tried to enter the Church of the Holy Sepulchre for the celebration, she was barred from doing so by an unseen force. Realizing that this was because of her impurity, she was struck with remorse, and upon seeing an icon of the Theotokos (the Virgin Mary) outside the church, she prayed for forgiveness and promised to give up the world. Then she attempted again to enter the church, and this time was permitted in. After venerating the relic of the true cross, she heard a voice telling her, "If you cross the Jordan, you will find glorious rest." She immediately went and crossed the Jordan and retired to the desert to live the rest of her life as a hermit in penitence. Approximately one year before her death, she recounted her life to Saint Zosimas of Palestine, who encountered her in the desert. She narrated her life's story to him and asked him to meet her at the banks of the Jordan, on Holy Thursday of the following year, and bring her Holy Communion. When he fulfilled her wish, she crossed the river to get to him by walking on the surface of the water, and received Holy Communion, telling him to meet her again in the desert the following Lent. The next year, Zosimas travelled to the same spot where he first met her, some twenty days' journey from his monastery, and found her lying there dead. According to an inscription written in the sand next to her head, she had died on the very night he had given her Communion and had been somehow miraculously transported to the place he found her, and her body was preserved incorrupt. He buried her body with the assistance of a passing lion. On returning to the monastery he related her life story to the brethren, and it was preserved among them as oral tradition until it was written down by St. Sophronius. In iconography, Saint Mary of Egypt is depicted as a deeply tanned, emaciated old woman with unkempt gray hair, either naked or covered by the mantle she borrowed from Zosimas. She is often shown with the three loaves of bread she bought before undertaking her journey into the desert. In Goethe's Faust Mary of Egypt is one of the three penitent saints who pray to the Virgin Mary for forgiveness for Faust. Her words are set by Mahler in his 8th Symphony, as the final saint's appeal to the Mater Gloriosa.